The church is located on Pittsburgh’s North Side, or Northside, or “Nor’side” in Pittsburghese, in the Mexican War Streets. If the locals ever get around to seceding we’ll be in Allegheny City once again!. We’re easy to find right along the northern edge of West Park of Allegheny Commons. You can see the downtown skyline from our front door. 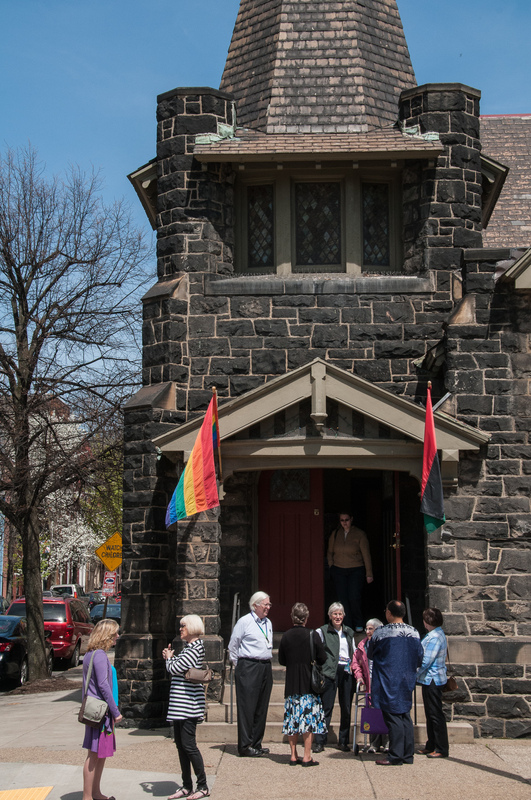 The Mexican War Streets neighborhood is pretty cool – black and white, rich and poor, gay and straight, young and old, yinzers and transplants all living in creative tension. The streets of Allegheny, Pennsylvania (annexed by Pittsburgh in 1907) were laid out during the 1850’s on land owned by General William Robinson. Many in the Mexican War Streets neighborhood are named after battles and generals of the Mexican–American War, which was fought over 1846-47, around 10 years after the Battle of the Alamo, and resulted in Texas and California being ceded to the U.S. Resaca Street is named after the Battle of Resaca de la Palma. Our services happen Sundays at 10:30am, rain or snow or shine, year-round, no summers off. The dress code is bike shorts or Sunday Best or anywhere in between. We sing together – a lot! Joys and Sorrows are shared from a microphone. We’ll offer some meditative time, but we’re an urban church, which means sirens, busses, trains, don’t expect much silence. Our minister says, “If there’s not a crying baby, it won’t count and we’ll have to do worship all over again!” There’s usually a message or sermon. We’ll take a Share the Plate collection which is shared with our current justice partner. We’ll also collect food for folks in need. After about 15 minutes children usually head off for their own activities and rejoin at the end. Worship is followed by some time for refreshments and reflection on the worship experience. You can walk to a playground or Lake Elizabeth in beautiful West Park. Families can check out the National Aviary, the Children’s Museum and Buhl Community Park at Allegheny Square, the Carnegie Science Center, and the Carnegie Library Federal Street branch. Stroll through the Mexican Wars Streets, Allegheny West, or Manchester historic districts. Want arts? The Mattress Factory Museum of Contemporary Art, the Andy Warhol Museum, and City of Asylum/Pittsburgh are all funky and close by. Want kitschy? The 40-foot rubber duck may have departed, but one word: Randyland. Want sports? Visit awesome PNC Park, home of the Buccos, or rockin’ Heinz Field, home to the Steelers. The old school Allegheny YMCA is a block away. Stop by The Urban Gardener and take home some native wildflowers. Take a walk along the North Shore riverfront trail. There are 4 bridges and 2 T stops that will take you downtown where you can check out the amazing architecture or dip your toes in the fountain at Point State Park. If you’re the amphibious type, try a Just Ducky tour, or stop by Venture Outdoors under the Roberto Clemente Bridge to rent a kayak and cruise the rivers. Now that we think about it, why would you ever leave? There is free street parking on most Sunday mornings. By all means get here a few minutes early to allow time to find a spot. They get a little harder to find when the Steelers play 1pm home games in the Fall. If there’s a chair or piano guarding a spot, don’t move it…it’s a Pittsburgh thing! 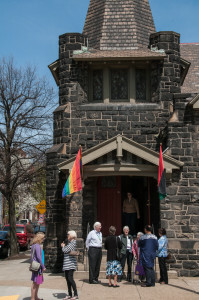 The Pittsburgh Parking Authority has implemented a Mexican War Streets residential permit parking area that encompasses some of the streets near the church, including the 400 block of W North Avenue ending at Resaca Place in front of the church. We understand enforcement will be Monday-Friday 7am-7pm only, and not on Sundays. If you have to ask someone for directions, bear in mind that Pittsburghers use things that aren’t there anymore as landmarks, for example. “make a left dahn where Three Rivers Stadium used to be”. Huh? Come by on the bus. We are served by the Port Authority of Allegheny County. The 13 Bellevue, 15 Charles, 16 Brighton, and 17 Shadeland all stop one block away at the intersection of Palo Alto St and West North Avenue, and the 54 North Side-Oakland-South Side stops on Arch Street nearby. Come on the Port Authority’s Subway, also known as the T Light Rail Transit system. The North Side Station near PNC Park (.5 miles) is closest, and the elevated Allegheny Station near the Casino (1 mile) isn’t far either. Did we mention that T rides are free between any of the North Side stops and downtown? Use the Port Authority’s Trip Planner or Mobile Website. Pedal power! It’s mostly flat around the church. Even kids can ride safely in West Park. The riverfront trail can take you upriver or downriver without being honked at. Heck, get over to Point State Park and you can ride all the way to Washington DC, among other destinations (bring a patch kit). Pittsburgh is rapidly adding more bike only lanes and infrastructure – sweet! We have bike racks in front of Unitarian House as well as a few light poles and railings to lock up your bike. Make sure to ride for our “Blessing of the Bikes” around Earth Day. And while not all UU’s believe in heaven, the pearly gates of Bicycle Heaven, the world’s largest bike museum, are only a short ride away and are open on Sunday afternoons. Use Bike Pittsburgh’s Getting Around Pittsburgh Planner. Bike sharing is here! Rent or drop off a Healthy Ride bicycle at one of 2 nearby bike stations (W. North Ave & Federal St. or Brighton Rd. & Ridge Rd.). Pittsburgh Bike Share has 50 stations around the city and opens in May 2015. Pittsburgh Yellow Cab, Uber, and Lyft all operate in Pittsburgh. Pedicabs are sometimes available also. We’re a friendly lot and sometimes have open seats, as long as you’re not embarrassed by bumper stickers that say “After the Rapture, Can I Have Your Car?”. Just ask and maybe someone can offer you a ride to get here or get home. The Federal North, Western Avenue, and East Ohio Street business districts all feature coffee shops, restaurants, and bars. You’ll frequently find us noshing just down the street at the Monterey Pub or over in Deutschtown at Max’s Allegheny Tavern. Bistro-to-Go, Lindos Restaurant, and Mullin’s Diner are popular spots for Sunday breakfast or brunch. Peppi’s makes legendary subs, and Nicky’s Thai Kitchen gets rave reviews. Or pick something up at Allegheny City Market. Several new restaurants are anticipated to open soon in the rapidly changing block of North Avenue near Federal Street. If you are in need of a little Sunday morning pick-me-up, local proprietors Crazy Mocha, Commonplace Coffee, and La Prima Espresso, as well as Starbucks are all close by. For the shortest trip on Sunday morning, stay in the neighborhood and just walk over. The Inn on the Mexican War Streets (2 blocks) in the renovated Boggs Mansion, The Parador Inn, (.5 miles), The Allegheny Inn (1 mile), and The Priory (1.5 miles), a former Benedictine monastery turned 42-room boutique hotel, are all in unique historic buildings and within easy walking distance. The several national hotel chains around PNC Park are not very unique but are convenient and an easy option. There are some local folks on AirBnB and some of the other popular place-sharing services.